These deep fried mozzarella balls with spicy dipping sauce were the first things that I tried when I got my new wok stand for my kamado grill. It took me three attempts to get them right and now they're a firm favourite among my party guests. To make my deep fried mozzarella balls you clearly need to have deep frying equipment. We used to have a deep fat dryer at home but after a few cooks it started to tarnish, the basket was difficult to keep clean and changing the oil was a pain. It was designed so that you could cook with the lid down to avoid spattering but I found that the cooking this way hindered the moisture extraction and the results weren't as good so I had to revert to cooking with the lid open...and that defeated the object. Other than that it was fine. I then took a leaf out of the Chinese method of deep frying in a wok and I've found this to be much more satisfactory. It disciplined me to cook with fresh oil and this enhanced the quality of my deep fried cookery but it still didn't stop the mess or the lingering smell. 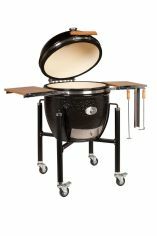 And then came the answer, I got a wok stand for my Monolith kamado and I've never looked back. I can make as much mess as I like, oil can spatter and I don't need to worry and there's no lingering smell when I've finished cooking. 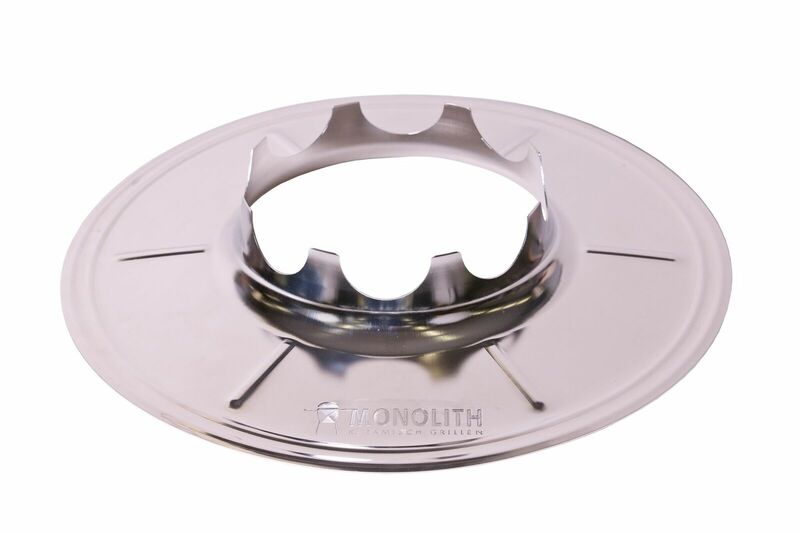 Manufactured from stainless steel, the Monolith wok stand is circular and sits either on the grill grate or directly on the fire ring. It's then press bent in the centre to create a hole which channels the heat from the fire to exactly the right point under the wok. If you want to research the different types of mozzarella then this is a good article to check out. In fact, using the wrong type of mozzarella was one of the mistakes that I made whilst perfecting this recipe. You see, being a bit of a food snob I thought I should use the best quality mozzarella, after all, these articles on the internet are telling me what is best...but not for how I'm cooking. A lot of the high quality mozzarella also has a high moisture content and this is not good when it comes to deep frying because the water quickly turns to steam, presure builds up and the mozzarella balls burst before the shell gets chance to crisp up in the oil. The result was an oily gooey mess that was inedible. 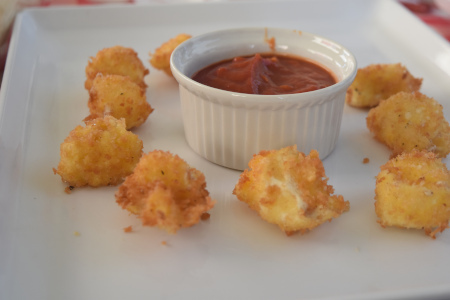 A "lower quality" block of mozzarella curd is much better for this recipe and whilst I've called the recipe deep fried mozzarella balls, technically they are mozzarella cubes. Note: Authentic mozzarella is made using animal rennet and is therefore not vegetarian. That said, because we are using a lower quality mozzarella, it's possible that your choice of mozzarella may be vegetarian. Safety: This recipe uses cooking oil (which is flammable) over a charcoal fire. 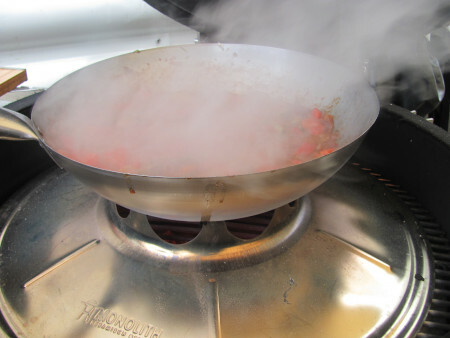 It's important not to overfil the wok with oil to minimise the risk of spillage. The only allergen in this recipe is egg. Cut the mozzarella block into 1cm cubes and then leave them to sit on kitchen paper for 10 minutes. Put the flour, egg and panko breadcrumbs into separate bowls and line them up in the order described. Add the garlic salt and oregano into the breadcrumbs and get your hands in a toss the mix. Line a baking tray with baking parchment and place it next to the panko breadcrumbs - this will be the tray where you place the finish mozarella balls. Dip each cube of mozzarella first in the flour, then the beaten egg and finally the panko breadcrumbs. As you complete the coating, line them up on the parchment lined tray and then place them in the freezer for 20 minutes. To make the sauce, heat the olive oil, add the garlic and gently cook until really soft. Add the chilli flakes, passata and sugar, and simmer for 15 minutes until thickened. The sauce will be pretty smooth but you can give it a whizz with a stick blender if you wish. Add the vegetable oil to the wok until it is no more than a third full, place it over the charcoal heat and monitor the temperature reaches 150°C. Take the mozzarella balls from the freezer and fry them in batches of half a dozen until golden brown, remove with a slotted spoon and drain on kitchen paper. Spear each deep fried mozzarella ball with a cocktail stick and serve immediately with the warm dipping sauce.